Most of us in the Government-to-Business space know of the United Kingdom’s decision two years ago to close Businesslink and Directgov, consolidating this onto a One-Stop Shop for government. For a short time many governments started toying with the idea of the über portal, but as the United Nations recently discovered the contemporary trend is actually moving away from this One-Stop Shop approach to a handful of customer-centric online offerings. What makes this even more significant is the quasi-return of Businesslink in another guise in the UK. After many years experience in government I know full well its often hard to see a government admit in private it got things wrong… let alone in public! But looking at what’s happening in the United Kingdom - or more particularly England - a seasoned observer can spot back-pedalling in government policy and service delivery. This is a good thing. Anything that improves the customer experience, and in doing so produces greater satisfaction in government and achieves effective channel migration and cost savings is fantastic. But where’s the evidence of all this I hear you say? Well lets start on a brief journey. Fundamentally the change in business customer services between Businesslink and .Gov.uk was radical. The Cabinet Office media release from 17 October 2012 made it clear that it wasn’t just cutting and pasting. The endeavor was to refocus what was published online, taking an 80/20 rule and removing all the unused content. The problem with this strategy is its not actually an 80/20 approach (20% of the pre-existing content is kept as it delivers 80% of the value.) Businesslink had already done this when migrating business services from agency websites onto it. This culled a lot of the rubbish that tends to litter the government webspace. However it meant that the next 20% taken and then published on .Gov.uk actually represented 20% of 20%: 4% of the original webspace. What happens when you do this? You get a backlash as customers can’t find online what they expect. On the UK business community website UK Business Forums there’s over 13 pages of posts of UK businesses screaming where did all of Businesslink’s useful content go and worse yet identifying inaccuracies. Proof of UK businesses still wanting this info can be seen half way across the globe in Australia where content rich Government-to-Business sites immediately saw a spike in traffic coming from the United Kingdom. Interestingly this spike then became the norm as Google.co.uk sends British businesses all the way to government websites for business in Australia. Talk about a global digital economy! The transformation of Government business support services has resulted in a new digital offering – GOV.UK (www.gov.uk). This is designed as a simpler and faster means for all firms to access business information, and I anticipate many businesses using it to find answers about compliance and regulation. However, that only works when people know what they are looking for; and there remains a problem when looking for advice including support and encouragement: it is not offered. The migration of some but not all BusinessLink business advice content to GOV.UK (along with material from Directgov) has opened up a gap in the online provision of this advice to small firms. This poses a danger that we undo a great deal of the good work Government and its partners have done to help people make a business idea happen. That is why I want to encourage the private sector to step forward with proposals to provide advice and inspiration to help people start and develop their businesses. In summary the information on Businesslink was good, small businesses needs it and if the government isn’t going to use it, it should be given back to the private sector to effectively rebuild Businesslink or elements of Businesslink. One thing I should point out is the devolution of government within the United Kingdom has created a strange dynamic for businesses. Under Tony Blair the UK central government started giving greater responsibilities to Scotland, Wales and Northern Ireland. This saw these governments delivering business services for their customers. When Businesslink was still around this content was effectively syndicated from the national site and republished on Business Gateway (Scotland) and Highlands and Islands Enterprise (Scotland) and Northern Ireland Business Info. Wales and England received the national offering. Now that Businesslink is gone, these devolved administrations have looked at what’s available nationally at .Gov.uk and decided that it doesn’t address their business customer needs. Business Gateway and Highlands and Islands have evolved into new business customer offerings and Wales have created their own site at Business Wales. Amazingly Northern Ireland have pretty much kept their previous Businesslink syndicated site and updated it with local content, effectively keeping the Businesslink offering continuing on the emerald isle. That said a totally separate site is also being run by Northern Ireland too. Either way, these customer-focused approaches complement the findings in the United Nations survey. Is that a DeLorean roaring down Westminster? 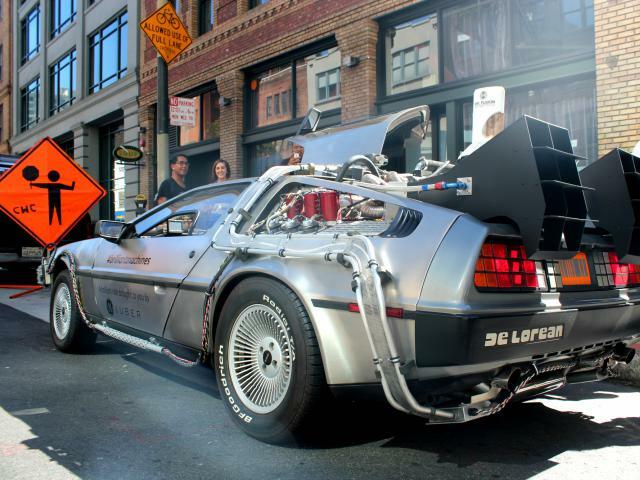 But the greatest and most convincing step in what seems to be “Back to the Future” is the UK tender documents closing this week calling for a multi-channel system for small and medium-sized enterprises. The contract released by the Department of Business, Innovation and Skills (the UK department that originally established Businesslink.gov.uk in 2004) estimates a contract spend between £6m and £10m. This is a far cry from Businesslink’s annual cost £35m - a figure that ultimately proved its undoing - however goes to show the commitment being made by the UK Government in better addressing business customers’ needs. The tender calls for business support services by phone and online channels. This supports a multi-channel view of the customer, recognising the need of delivering more expert advice via phone. Interestingly though face-to-face services are not included. And while phone support seems on paper to not reflect the “digital by default” strategy of the government, the successful supplier is encouraged to maximise the usage of lower cost digital contact channels in line with Government policy. Sounds a lot like what Businesslink was! The tender outlines the service is for England. So while Businesslink may have cost a princely sum to deliver it did so in a way that content only had to be developed and maintained once. With the introduction of this new service it effectively means effort across the broader United Kingdom is being duplicated six times over (GOV.UK and then five separate national offers.) No matter what way you approach things, that doesn’t seem a very efficient use of government resources. The learnings here for governments is to recognise that a customer-centric view of government service delivery is critical. Businesses cannot be easily lumped in and treated like citizens. The complexities of starting or running a business can’t be compartmentalised into one or two paragraphs supported by some pithy dot points. Business owners and operators know this. Sure there are certain topics that can be addressed quickly and simply. But if you dumb complex topics too much, business owners will worry about what’s missing and consequently what will be the implications for them. So instead focus on understanding the needs of your jurisdiction’s business customers and how you can improve their service delivery experience and journey. The benefits to business, the broader economy and your government will be significant and well worth the effort. Disclaimer: Gavin Atkinson - the author of this post - helped deliver Businesslink.gov.uk during 2007-2009, leading Businesslink’s international trade section and heading their customer insight function. Gavin would like to state that while Businesslink achieved some amazing things for its customers, it wasn’t a perfect channel vehicle and could've been improved further. But that's what iterative improvement is all about.